The Farmer's Barn Fall Festival is THE go-to place for good, clean, family-fun for everyone in the family, regardless of age! 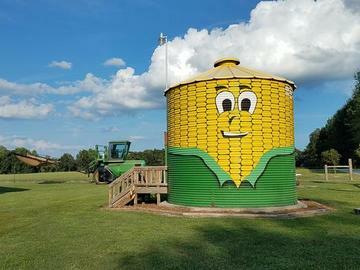 Enjoy the many activities such as the Corny Corn Bin, Cow Train, Corn Hole, Tug-O-War, Hay Ride, Tire Mountain, Zip Line, Roley Poley, Animal Corral, Photo Ops, and Fall Maze! Our goal is to help you make memories that will last a lifetime and to bring everyone in to the kind of fun that can only be experienced on the farm! We welcome you to join us and be a part of the farm family!